Today we went to the swing set at the park near our apartment. It's probably you're most favorite thing in the whole world. 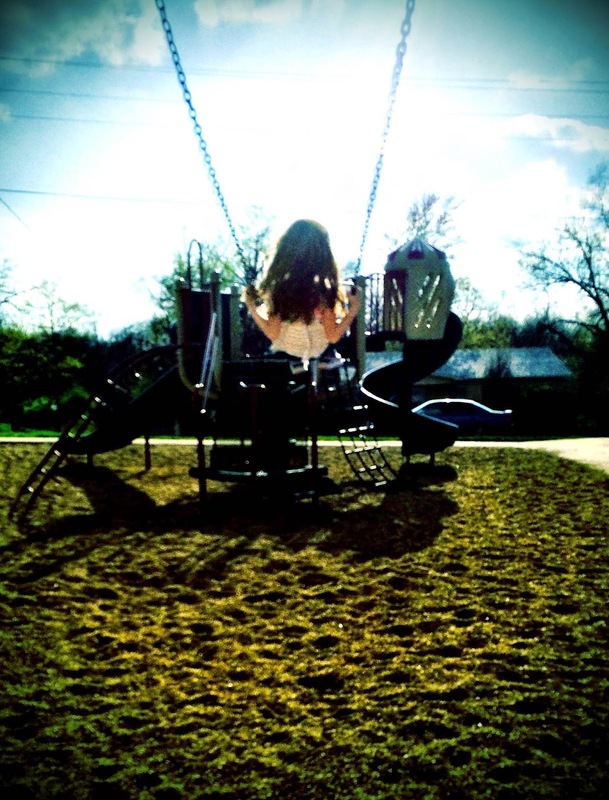 As I pushed you, I was amazed at how a year ago you used to be so afraid of the "big swings". I would try and try to coax you onto them, but the baby swings were always more up your alley, and you have always blossomed in the "safe". This past year, I have watched you evolve from the sweet, timid baby you once were to the independent little girl you have become. You have traded in your Mickey Mouse Clubhouse for Frozen, your blankies for American Girl dolls and their endless clothing choices, and the days of allowing me to dress you like a child straight out of Baby Gap have been replaced by your own keen fashion sense that reminds me daily that skirts, your Super Girl costume, or tiaras are acceptable attire for every occasion. Your vocabulary has grown so much in the last year, and I find myself being able to have real conversations with you that are full of your incredible sense of humor. I can't even begin to count the number of times you have made me laugh out loud! You are silly and playful just like your Dad, and I love watching that side of you mold your personality. I hope you keep that part of you always and that because of it you will always remember to never take life too seriously unlike your Mom. Your heart has seemed to grow bigger over the last year. Your compassion and sensitivity to others never fails to amaze me. You are always quick to tell me when someone at school got hurt or to save you Subway bags and McDonald's toys for Grandma's shoe boxes that she send to kids in other countries who don't have anything. You are gentle with everyone around you, and you try to always be the peacemaker. Your heart has been able to weather all the changes you have been subjected too over the last three years, and you have walked away from all of it with your pure and forgiving spirit still intact. This year, your heart also made room for your new stepmother in the most beautiful way. I have loved watching you come to love her as she becomes your soft place to land when you are at your Daddy's. It has been the answer to one of my most fervent prayers, and I have learned so much from you and your gentle acceptance of her place in your life. May I always follow your lead when it comes to understanding how to love people. Your horizon has widened over the past year. I have watched you try out your wings as you tackle the adventures of kindergarten, sleepovers, making new friends, and finally being tall enough to ride most of the rides. It saddens me to know that as the years go by your wings will take you farther and farther from me towards the woman that God is molding you to be and the future I know that He has for you, but something tells me that no matter where He takes you that you will always find a way to return home to place where you began. I can hear the adventure of 6 calling your name, and I am thrilled for everyday that God allows me to be apart of it. I hope that you continue to explore and grow, but that you know that no matter where this life takes you, I will always be here loving you, cheering for you, and ready to be your haven from every storm or bad day. I want you to know that being your mother is and always will be my greatest accomplishment and my most outstanding achievement. You are my "well done, good and faithful servant". The biggest jewel in my crown. Happy early birthday, sweet girl. Today is the last day you will ever be 5, and so far, I think 5 has been my absolute favorite. But in my heart, I am ready for 6, and I know you are too. So, here's my hand. We will go there together.